It’s a rare event that I cave in to buying something frivolous, just for myself. I have a big, growing family involved in music lessons, a home, a business of my own, my husband’s business. There is never anything left for foolish indulgence. The bright pink shoes on the display table were made of the softest leather, leather lined and leather soled. They were my size and they were on sale. 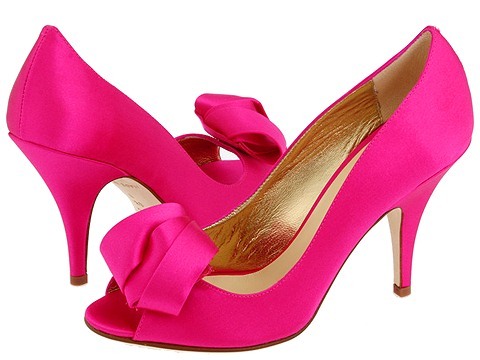 I imagined myself wearing them on Easter Sunday, with my fuschia-coloured dress. I pictured them, casual style, with tight jeans and a bright shirt. I felt them moulding perfectly to my feet as I met clients in my studio/gallery. They were like two bright spring tulips in my garden, like two punchy blobs of paint on my palette. I left the store and dreamed of those shoes for a month. I blame the barrel for my weakness for unusual shoes. I must have been eight when my father announced after supper that he had a surprise for us. We were to wait for it in the living room. I heard a distant rumbling coming closer to us down the long hallway. Dad rolled the barrels into the living room, popped off the lids and dumped out the contents all over the living room floor. Shoes, hundreds of leather shoes, poured out – red, pink, shiny patent black, pointed, squared-toed, buckled, laced, buttoned, strapless shoes. It was raining shoes! Shoes flooded the floor. The river of shoes flowed down the hallway. While my siblings and I charged in like hungry children on a plateful of doughnuts, our father explained how the shoe store in town was closing and the owner had offered Father a deal — $5 a barrel of shoes. It was the ’60s and Father had a big family and was the principal of a private college. He often had students in need. So, he bought the whole lot. But there was one catch. There were no two shoes that matched exactly. Some came pretty close, but the shade of brown was slightly different or the buckle on the left shoe was bigger, or the right shoe had two straps instead of one or the left shoe was size 5 and the right was size 7. It wasn’t that noticeable if you didn’t stand at attention, feet touching. From then on, whenever I needed a new pair of shoes, I went to the barn instead of the shoe store and rummaged around for a passable pair. Often, I had to polish them to make them match better. Whenever Father’s students or our own friends came over, we would casually offer them a new pair of shoes as if were a glass of water. It was always a frenzied treasure hunt to find the closest match and the best entertainment we could offer our guests. Over the years the cache of shoes dwindled until the last of them went up in flames the night the barn burned down. One thing I learned from that barrel of shoes, is flexibility. You can make do with whatever you have. With a bit of imagination and some shoe polish you can make things work. You can put up with a little discomfort for style. The pink shoes were still there last week – the very last pair on the sale table They were a little tight, but I knew from experience that that wasn’t a big problem. The leather would stretch. They were outrageously pink, extravagant and beautiful and a barrel of fun to wear on Easter Sunday.